This is the 3rd part in a series on how the Greek translator of the Hebrew Bible strays from his literal rendering of the original. It’s our look at how he adds what English translator Albert Pietersma calls “interpretive spins” and “literary sparks” in Hellene, spins and sparks that have seemingly less to do with the first Semitic purposes of the text and more to do with Greek literature before it. This post is on a spin and a spark in the 23rd Psalm. In Greek (as the 22nd Psalm) it starts out with a title: Ψαλμὸς τῷ Δαυιδ. That can mean something like: A Strumming to David’s Rendition. Then in verse 3, those “paths of righteousness” are these kinds of paths in Hellene: ὡδήγησέν [Odegesen]. οὐ τότε γ’ ὧδ’ Ὀδυσῆος ἀγασσάμεθ’ εἶδος ἰδόντες. ἦ γούνων λίσσοιτο προσαΐξας Ὀδυσῆα. What I’m hoping we’ll notice is how Odysseus is telling his story (as Homer gives it), and look how he is leading us listeners and readers up to the point where he plays on his name (“Nobody” for “Odysseus”). You see that our hero has given this awful sheep-and-human eating Shepherd a cup full of black wine. The cup overfloweth. With “wine of strength.” Three ivy-bowl-fuls are drunk (“he took it and drank it off, and was terribly pleased with the wine he drank”; “Give me still more, freely,”; “three times he recklessly drained it”). The monster gets drunk (“the wine had got into the brains of the Cyclops”). Lancelot Brenton turns that into English as “like the best [wine].” And Pietersma changes the Greek into English as “was supremely intoxicating.” Neither one is a bad translation, and the latter does, I think, reflect the senses of the individual words best. Maybe we should not so strongly hear the Odyssey story of Book IX here. Maybe we should not so quickly notice the mention in the very next verse, the final verse, how there’s this emphasis on “pity.” So let’s come back to that. Let’s move away from Homer. Let’s listen, instead, to Socrates (as Plato gives his speech) and then to Aristotle. Let’s now read the phrase, μεθύσκον ὡς κράτιστον [or “drunken drink that’s extremely stout”], against the injunctions against strong drink and drunkenness by Socrates (and Plato) and Aristotle. Here is Plato’s Socrates giving advice, and then here is Aristotle giving advice. When a democracy which is thirsting for freedom has evil [κακῶν] cupbearers presiding over the feast, and has drunk too deeply of the strong wine [ἀκράτου αὐτῆς μεθυσθῇ] of freedom, then, unless her rulers are very amenable and give a plentiful draught, she calls them to account and punishes them, and says that they are cursed oligarchs. Why, when a democratic city athirst for liberty gets bad [κακῶν] cupbearers for its leaders and is intoxicated by drinking too deep of that unmixed wine [ἀκράτου αὐτῆς μεθυσθῇ], and then, if its so-called governors are not extremely mild and gentle with it and do not dispense the liberty unstintedly,it chastises them and accuses them of being accursed oligarchs. Nor yet again is the boldness of the sanguine the same thing as Courage. The sanguine are confident in face of danger because they have won many victories over many foes before. They resemble the courageous, because both are confident, but whereas the courageous are confident for the reasons already explained, the sanguine are so because they think they are stronger [κράτιστοι] than the enemy, and not likely told come to any harm. （A similar boldness [implied κράτιστοι] is shown by men who get drunk [οἱ μεθυσκόμενοι], for this makes them sanguine for the time being.） When however things do not turn out as they expect, the merely sanguine run away, whereas the mark of the courageous man, as we have seen, is to endure things that are terrible to a human being and that seem so to him, because it is noble to do so and base not to do so. Both Plato and Aristotle assumed their readers knew Homer. The Cyclops story and the wordplay of Odysseus was famous and was a way to teach Greek peoples of the virtues of their heroes and of the evil and the downfall of their enemies. Here, nonethless, Plato and Aristotle rather independently of Homer (and maybe as a more direct directive against the indirectness of the epic poet) are writing against intemperance. My point is that the little Greek addition to the 23rd Psalm once in Hebrew is one potent cup of Hellene. For the translator to add – μεθύσκον ὡς κράτιστον – in the context of the Psalmist, the Strummer, this David singing of his Shepherd is rather interesting. The addition is interesting within the context of Alexander the Great’s Alexandria. (Alexander, as we all know, was the student of Aristotle.) Temperance was the ideal of citizens in Greek democracy. Intemperance was barbaric and got the Cyclops in big trouble. 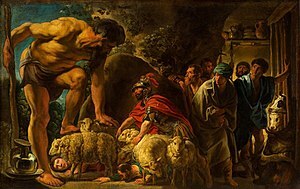 Polyphemus, the Shepherd, was showing no pity, and no mercy. 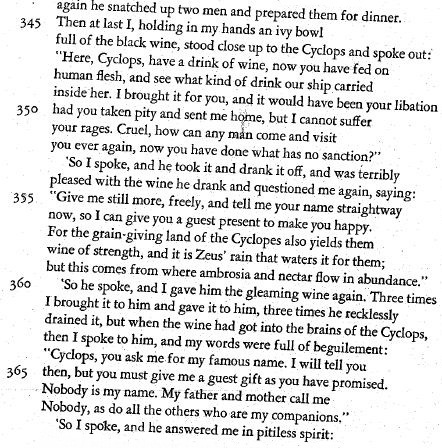 Odysseus had to resort to wordplay, to strong wine Yes, but to tricksterism. Maybe the Greek translator is being a trickster also, like Odysseus. Surely the translator in Alexandria knows what Alexander’s teacher Aristotle and what Aristotle’s teacher Plato (and Plato’s teacher Socrates) intended for Greek citizens, that they should not be intemperate and get drunk quickly with such a false boldness as the fools who are not Greeks. And yet the Strummer David’s rendition adds – μεθύσκον ὡς κράτιστον – Your cup “gets me drunk with the stoutest of drink.” Is this more like tricky Homer? What is emphasized by the Talmud (according to Seidman) is how you’ve got to know your Greek to really get what’s going on in the Septuagint. The comparison between the status of Homer’s text and the LXX as ‘scripture’, that is, a ‘standardized’ text [page 188]. As soon as the translation is completed, the Jews of Alexandria are called to a gathering and the new text read out to them…. The reading is follwed by the acclamation of the Jews — either the Jewish community of Alexandria, or the Jewish people: the dual layer of meaning is to be read into this section too. Then the leaders of the Jews stand up and make the following statement: ‘Since this was translated rightly and reverently, and in every respect accurately, it is good that it should remain as it is, and that there should be no revision.’… There follows a malediction uttered by the whole people against anyone who might make any addition or change to the text…. 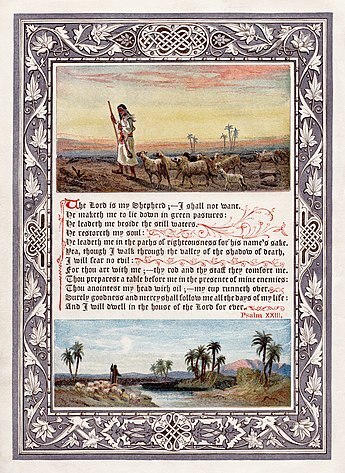 As [Harry] Orlinsky has convincingly shown, the successive elements in this scene correspond in an accurate manner to the ‘biblical procedure in designating a document as official and binding, in other words, as divinely inspired, as Sacred Scripture. In my post here, I’m not so interested in the validity of the Talmudic account (or Seidman’s representation of such) or the validity of (what Honingman recounts as interpretations around) the Letter of Aristeas. Rather, I’m interested in the literary sparks and interpretive spins that we Greek readers today might see in the Psalms; and, I believe, there’s an ancient Alexandrian Jewish view of the Greek text that gives it much more respect than the typical Christian reading gives it. Whereas a Christian reading might validate the Septuagint as inspired by God especially since the New Testament writers quote it so much, an ancient Alexandrian Jewish view is quite different. The literary and the rhetorical, in the political and cultural and linguistic climate of Alexandria, are key to understanding the Alexandrian Jewish view or views of old. and my dwelling [shall be] in the house of the Lord for a very long time. See how “Surely goodness” is missing. Notice how that leaves “mercy” or, in other translations of the Greek word in Homer, “pity.” No goodness is noted after the intemperate “drunkeness with the stoutest of drink” is added. Only “pity” or “mercy” is sung about “all the days.” Now, in the Jewish Greek version this final interpretive spin does indeed seem to be some sort of literary spark. As with Homer and Homer’s Odysseus, it seems we have to be literary or Greek insiders to get the tricky wordplay. Otherwise, we’re as deaf to the differences and then as blind as the blinded, one-eyed Cyclops. In Homer’s Odyssey (Book 9), … When Polyphemus asks for Odysseus’ name, promising him a guest-gift if he answers, Odysseus tells him “μή τις,” literally “nobody.” (which, when combined, as in speech also meant “cunning” – “μήτις,” and is thus, a play on words.) Being drunk, Polyphemus thinks of it as a real name and says that he will eat “nobody” last and that this shall be his guest-gift—a vicious insult both to the tradition of hospitality and to Odysseus. Surely no mortal against your will can be driving your sheep off? Surely none can be killing you by force or treachery? Good friends, Nobody is killing me by force or treachery. It’s funny enough in English to hear that “Nobody” when we know that it’s the Somebody of the Odyssey who really is about to kill by force or by treachery. The Greek, of course, plays better. And there is much play, many plays. This is why the wikipediaist got tripped up. So, as I said, the Greek, of course, plays better. I think this is true of the Septuagint version of the Psalm too; the wordplay in Greek adds a playful, dramatic literary spark and interpretive spin. Off topic — when you find an error in Wikipedia (I find them often), what do you do? Me, I just chalk it up to the decline of Western Civilization, but I feel guilty — what I really should do is correct it (which is, after all, quite easy to do.) I am still not quite able to analyze why I don’t take the extra step of correcting the mistakes, though. Good question. I wish I could say I consistently corrected errors, but I don’t. When it’s something I’ve studied a good bit, or am passionate about, then I usually make the correction. However, I often am just lazy. I like using wikipedia but find it much more work to contribute to it. And now I have the dilemma of whether to correct the entry I’ve mentioned in the blog comment, and then to have to ammend my comment or make another — or whether to just leave it. For now, I’ll leave it. I should have mentioned, by the way, that I find this to be the the best of your entries in this series. I’m still working my way through the implications of what you are saying here. Theophrastus, Thank you. For some reason, I’m having more trouble with the image and paragraph formatting in this post than in others. I’m interested in what you see as implications. For me, I really don’t believe the translator wants the Greek version to make David intemporate. My confession: read against Homer, Plato, and Aristotle, the added phrase in the Psalm and the deletion of the phrase for sure goodness the new Psalm (i.e., LXX 22) is very difficult. I like the Hebrew Bible 23rd Psalm much better. Maybe I’ll try an English translation of the Greek to work through this better, to show how I’m perplexed. My main point is that the Alexandrian Jews (and others in their city) would have read the Psalms intially in the context of a rich literary and remarkable cultural center.